Divitiae ducunt et forma et gratia currum. et dolor et tristis pudor et mors atra sequuntur. Riches, Beauty and Grace lead the chariot. slow Time, Pain, sad Shame and dark Death. The object on the shoulders of Time looks similar to that held by the Sola Busca trump V Catulo. Thanks for finding those photos and translating the text, Marco! Absolutely fantastic. A great cognate for the "middle section" of the trumps. I wonder what the other two chariots have to say? It does indeed, good catch. I wonder if it is a balance or weight-scale? But then, why not like the common kind (like Justice always holds)? Also, it looks like Time is holding a lantern. Thus, even when the hourglass turned into a lantern in Tarot, the figure could stil be considered an allegory of Time. The mural and poem are truly wondrous! Thank you, Huck and Marco. The figure of Time seems to be repeated (with a slight variation) to the far right of that row. It's difficult to see what he's holding, but he has the same unidentified object on his shoulders. I've got my wife using "Google Goggles" to see if the computer can search for similar shapes on the internet. There's got to be something for home computers that can scan pictures too, and look for visual cognates. Update - no luck, apparently, even with a clipping path around the object in Catulo's hand. If we forget Catulo's (much smaller) object for a moment, the object carried by Time could be said to resemble a Roman pack pole or furca. The top of the one on the facade is shaped a little like a yoke, or perhaps strengthened in the middle, and although the one in the illustration is not, the proportions and size are not that dissimilar. That doesn't explain why he's not holding it, or what the two objects suspended from it are, unless they're weights (or possibly bells?). Might Time simply carry weights rather than a balance? Catulo's object looks a little like this Roman scale - perhaps he's checking that the weight is accurate rather than actually weighing something. Pen wrote: .....That doesn't explain why he's not holding it, or what the two objects suspended from it are, unless they're weights (or possibly bells?). Might Time simply carry weights rather than a balance? That would be a foliot verge escapement. It is a part of an early clock. The arms swivel back and forth on the vertical axis. Those are weights on the ends, which regulate the speed of motion. 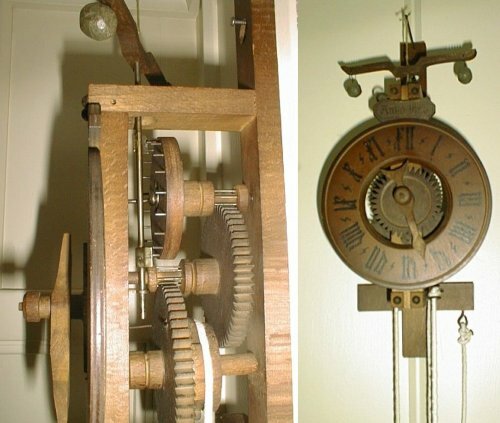 This was the discovery that made the mechanical clock possible. It preceded the pendulum as a means of regulation. In the case of this wall painting, Old Man Time has the moving part of a clock (of that time) sticking out of his back. The modern equivalent might be to attach two alarm clock bells onto the top of his head. Old Man Time himself is the actual "clockwork mechanism". The Sola Busca "Catulo" card (posted above) shows the mechanism better. The two little paddles (pallets) that are attached to the vertical shaft regulate the transfer of power to the gear train as the drive weight drops by engaging and disengaging a crown wheel, like a ratchet. If you google "lantern clock" you'll discover something hollow about the popularly held theory of a copyist's "error" that resulted in the shift from an hourglass to a lantern in the Hermit. It's not an "error" if there's nothing "wrong" about it. Thank you OnePotato! Catulo's mysterious object finally has a meaning! I have checked Ripa. In one of his versions of Time he is said to hold scales or a "geometrical weight" ("colle bilance ovvero col peso geometrico in mano"). As far as I know, "peso geometrico" could be the Italian name of the verge escapement.